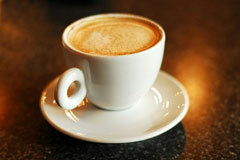 A barista is a specialized chef who has been trained to prepare and serve espresso-type coffee drinks. The word barista, which is Italian, means "bartender" and was originally used to describe men and women who prepared and served both hot and cold alcoholic and non-alcoholic drinks. Today, the word is most commonly used as part of coffeehouse jargon to refer to anyone who is passionate about coffee and espresso, and who has achieved a certain level of expert status when it comes to making and serving espresso and coffee. An espresso drink is any type of drink that contains espresso, which is a strong, undiluted black coffee that is made by forcing steam through ground coffee beans. Espresso coffee drinks are quite varied; they can be hot or cold, iced or blended, and can include or not include steamed milk. Espresso drinks are only limited by the barista's imagination — typical espresso drinks might include flavorings like chocolate, while one very creative espresso drink calls for flavoring with maple syrup and bacon! Regardless of what ingredients the espresso coffee drink is made with, the most important ingredient is always the espresso. If the quality of the espresso is not good, it's a fair bet that the espresso drink won't be good either. Because coffee has a shelf life and is not fresh beyond a certain point in time, most baristas buy and brew only what they can use within one week. It does not take any special aptitude to become a good barista, and while education is important, formal schooling is not. 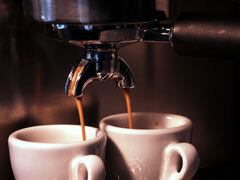 Anyone who loves coffee and espresso and is passionate about learning more can become a good barista. In order to brew the perfect cup of coffee or espresso, a barista must learn about where coffee comes from, how it is grown, and how certain blends and roasts should be treated. Baristas are aware of exactly how certain coffees and espressos should taste; they also know the ins and outs of all the brewing and grinding equipment that is necessary to transform coffee beans into a terrific hot beverage. The American Barista & Coffee School, located in Portland, Oregon, and the Seattle Barista Academy, located in Renton, Washington, offer training for budding baristas and coffee business entrepreneurs. A grinder for transforming whole beans into grinds. Steaming pitchers for pouring foam and milk. Clear shot glasses, so you can see the espresso as it pours. A steaming thermometer to ensure that the milk doesn't burn. A tamper, for pressing ground coffee into the filter. A knock box, for collecting spent grounds. An inventory of beautiful cups, saucers, spoons, glasses, and designer mugs for presentation. For more insight on the barista profession, read this news article about barista training. With passion, education, the right tools, and a little imagination, anyone can become a barista, and enjoy the experience of drinking a well-made espresso coffee drink.